As we have read in previous editions of Know Our Heritage, the number of African-Americans in Cleveland swelled during the first decades of the twentieth century, as African-Americans moved from the rural south to the industrial north seeking greater opportunities. 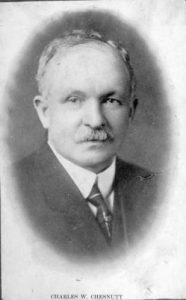 One of the most well-known African-Americans in Cleveland during this time period was Charles W. Chesnutt. Born in Cleveland on June 20, 1858, Chesnutt was the son of two free African-Americans who had moved north from Fayetteville, North Carolina. After the Civil War, his family moved back to Fayetteville, where his father opened a grocery store. Chestnutt attended the Freedmen’s Bureau School, and then he taught first in Charlotte and later at the State Colored Normal School in Fayetteville. Discouraged by Reconstruction and increasing segregation in the south, Chesnutt returned to Cleveland in 1883 with his wife and family. In Cleveland, he passed the state bar examination and established a court reporting firm. Chesnutt also established himself as a writer. His first short story was published in the Atlantic Monthly in 1887, the first story by a black author to appear in that publication. After being published in other magazines, Chesnutt’s collection of short stories, The Conjure Woman, was published by Houghton Mifflin in 1899. A second short story collection was followed by a novel, The House Behind the Cedars, in 1900. Chesnutt’s grandmothers were of mixed race and his grandfathers were likely white. Chestnutt himself could have passed as white, but never chose to do so. His writing presented a realistic depiction of the African-American experience in the south and centered on themes of identity and racial inequality. Chesnutt gained great wealth from his stenography business, but was never able to write full time. He lived at 64 Brenton (later 2212 E. 73rd Street) from the 1880s until 1904, when he purchased a larger home at 9719 Lamont (demolished for the Charles Orr School after Chesnutt’s death in 1932). He supported the local branch of the National Association for the Advancement of Colored People. Although he was overshadowed by the work of the Harlem Renaissance in the 1920s, he is seen today as a major figure in African-American literature. Another nationally known African-American writer from Cleveland was Langston Hughes. Hughes came to the city as a teenager with his stepfather, who worked in the steel mills, and his mother. When he was attending Central High, his mother and stepfather left for Chicago in search of work. Hughes lived alone in an attic apartment at 2266 East 86th Street. It was here that Hughes began to write, and it was during this time that he first met Rowena and Russell Jelliffe, the founders of Karamu House. In the 1930s, many of Hughes’ plays premiered at Karamu House, right in his old neighborhood. 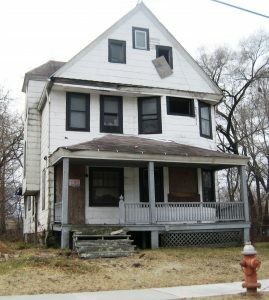 In 2009, the house on East 86th Street was abandoned and might have been demolished had it not been for local historian Christopher Busta Peck of Cleveland Area History. Peck made the City of Cleveland aware of the property, which was acquired and rehabilitated by Fairfax Renaissance Development Corporation. Founded by the Jelliffes in 1915, Karamu House is a settlement originally called the Neighborhood Association and located at 2239 E. 38th Street. It began producing plays with interracial casts and, in 1927, acquired a theater adjacent to the settlement which was named Karamu, Swahili for “a place of joyful meeting.” A fire destroyed the theater in 1939 and Karamu was rebuilt ten years later with support from Leonard Hanna Jr. and the Rockefeller Foundation. In 1980, the Imani African-American Dance Company, similar to the original Karamu Dancers, was founded. As a community-based nonprofit arts and education institution, Karamu has maintained its role of supporting African-American arts and culture. Music has a strong legacy in the African-American community in Cleveland. The city’s deep network of churches has provided a wonderful foundation for many groups, and the city has been nationally recognized as a center of Gospel music. The most renowned, Wings Over Jordan Choir, was founded in 1935 by Rev. Glenn T. Settle of Gethsemane Baptist Church, which was located at East 30th Street and Scovill Avenue. Rev. Settle believed in using spirituals to spread Christianity, and was able to arrange for broadcast of the choir nationally through CBS radio. Wings Over Jordan enjoyed immense popularity across the country, as well as internationally, through the 1940s. The choir toured during WWII for the USO and performed at the White House. Many buildings associated with Jazz music, such as the Douglas Club on Cedar Avenue and the Hotel Bruce on Euclid, are no longer standing. A building related to the early history of Rock and Roll still exists, tucked away in a quiet residential neighborhood in southeast Cleveland. The Boddie Recording Company, at 12202 Union, was founded in 1959 by Thomas Boddie, who transformed an old dairy building behind his house into a studio. Boddie recorded gospel, soul, rhythm and blues, rock bluegrass and country in the studio. The studio’s inexpensive prices for recording attracted acts from as far away as West Virginia and Detroit, Michigan. After Thomas married Louise Boddie, her connections with churches and gospel groups helped propel the studio to even greater success. Boddie would eventually record as many as 800 individual original records on seven different labels. The studio remained in operation until 1993. Icabod Flewellen was born in 1916 in Williamson, West Virginia. When he was thirteen, he began to collect newspaper clippings dedicated to the history of African-Americans. In 1949, when his home was firebombed by white supremacists and his collection destroyed, Flewellen migrated to Cleveland. In Cleveland, Flewellen again began collecting African-American historical artifacts. He founded the Afro-American Historical and Cultural Society in his home at 8716 Harkness Avenue (pictured left) in the Hough neighborhood in 1953. Flewellen collected much of this material by going from door to door and asking neighbors about their family histories. Eventually he purchased the Cuyahoga Telephone Exchange Building at 1839 E. 81st Street to hold his collection. 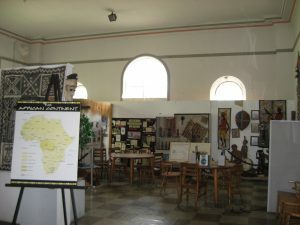 African American Museum within the Icabod Flewellen Building. Flewellen later took the collection to the former Hough Branch Library at 1765 Crawford Road. This English Renaissance Revival style building was completed in 1907 and was a fully functioning branch of the library system until 1966, when it became Treasure House, a children’s library. When the new Hough Library was built in 1984, Cleveland Public Library sold the building to the African-American Museum and it was renamed the Ichabod Flewellen Building. At this time, the African-American Museum has not been open for several years, although there have been attempts to restore the building and reopen the museum. The Flewellen Collection of artifacts is now housed at the East Cleveland Library.